Bare torsos, dramatic red embroidered jackets and long trenchcoats had the audience gasping during Rohit Bal's show. Male models in crushed skirts provided the required shock value. Brushing aside the attention that is traditionally paid to women at the Lakme India Fashion Week, Rohit Bal once again presented a complete menswear collection. 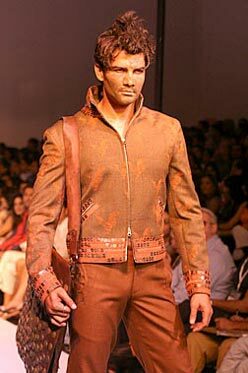 The show was a tribute to the alpha male, whom he presented in various looks. There was the mohawk haired model in a heavily embroidered black jacket with red detailing. There were models in crinkled grey skirts, dhotis, sarongs and jackets made from antique Naga shawls. The only thing that did not find a place in the collection was the classic suit. "A man can wear anything and still look manly. I wanted to show the beauty of the male form and that shines through my clothes," says Bal. The motifs of the eagle, the peacock or the rooster were imprinted on almost every jacket, in line with the theme of the collection, which was titled Birds of Paradise. There was, however, a twist. The models had sand rubbed on their faces to give them a deglamourised look. Bal's was a tightly edited show -- it lasted only 18 minutes and yet showcased 85 garments. No wonder then, the popular Delhi-based designer had his home crowd cheering him on. Spotted at the show were Shweta Nanda, daughter of Amitabh Bachchan, flanked by family friends designers Abu Jani and Sandeep Khosla, model and actress Katrina Kaif and a whole lot of socialites.